Welcome back for Day 7, if you are just arriving for the first time all the details and the linkup can found HERE. Today I have SugarPea Designs and some of their designers as my guests. Sugar Pea is a sponsor for this event and is offering a $25 gift certificate for there online store. ..and two from me, I couldn't decide which one I liked more--the kraft and the ivory tag. Comment for your chance to win here today. I especially love the black tag. The colors really pop against it. These are all so adorable! I love the elves! Love the cheeriness of these designs. Aren't these stamps such fun? 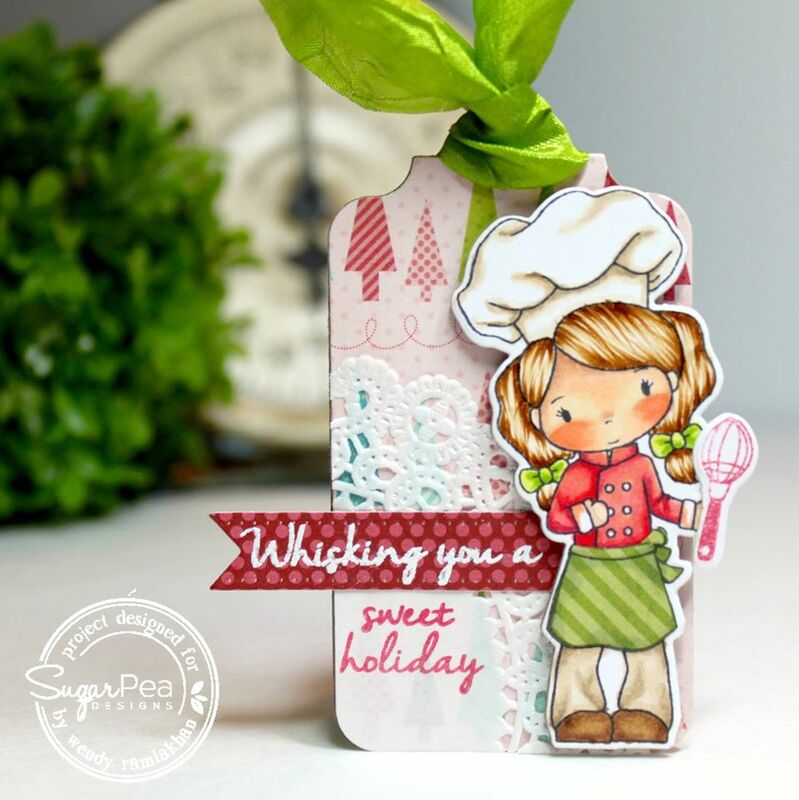 Love all the Tags showcased today using Sugar Pea Stamps. They are all beautifully created and designed. What sweet tags! 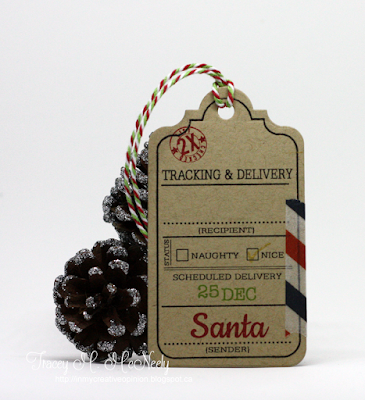 I love the Santa delivery tags...too cute! I make all of my gift tags so I'll be getting lots of good ideas from these postings. thanks for sharing it. More awesome tags again today! Love the cute images! Oh, my! Are these ever cute. Leyley was sure ambitious - look at all those tags. Thanks again for another great day of tags. 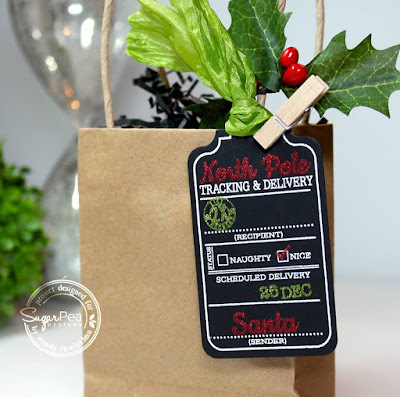 Love the chalkboard style -- and your two kraft/white tags! Oh how wonderful!! I love your tags with that cute stamp. The addition of the tape is adorable. Loving your fun posts. Thank you for doing this!! LOVE the shapes of the tags today. The tracking & delivery tags made me chuckle! LOVE it. Okay, I'm a bit late to this party, but I promise to hang in there till last call :) Fabulous tags. Sugar Pea Designs! Their release is so cute! Of course we all love those little elves. And sure enough they are perfect for tags! Last week I saw Dana Joy using there gorgeous stamps and dies on periscope to make some beautiful cards. I definitely need those elves. The 25 days of Christmas tags. I came here from Sugarpea for a closer look. Awesome tags and lovely idea, might just need to make some tags. Thanks for the inspiration off to take a look a your pinterest board. I love SugarPea Designs. These tags are fantastic! Thanks for the chance to win. I love your Kraft tag - it goes great with the postal theme!! aND the disgruntled elf with the oversized package..... too cute!!! Every one of these is so adorable. Love the clever designs! The 12 Days set is absolutely precious!! I love your tags. Those stamps are so cute. More fantastic tags ladies. You are all so talented... love the sweet little image... great coloring too... the chalkboard tag looks amazing. Keep them coming! Some of the best tags so far, I love that tracking and delivery stamp! That 12 Days of Christmas set is too fun! They are all fantastic, Tracey! What cute elves and I love that tag shape and stamp that you used! Both colors are great and the washi tape is perfect for it! Such talent and such great images. Thanks for sharing them all. Now, these are all just too much fun!! Love them! Gorgeous tags. Persobslly, I like the ivory one. It seems 'cleaner'. The inspiration is fantastic and endless. Enjoying the designs. Oh my goodness... These tags and sentiments are so stinkin' adorable!!! I love both of your tags, Tracey! That little strip of washi tape along the side is such a good idea. And your guest designers today have such cute tags! So many cute tags! I really like the baking one! wow, all of these tags are completely adorable! Wonderful tags from the Sugar Pea Designs team. I really like your kraft tag since I love anything kraft. Wow, today's tags are all awesome. love each and every tag here. Adorable tags!! 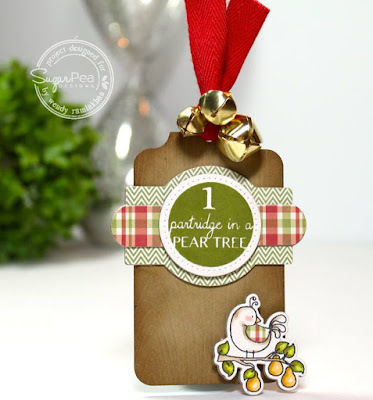 I love the partridge in a pear tree! Ohhhhhhhhh I just loveeeeeeeee this!!!! Each of these tags are simply fabulous...what a total eye candy ...Thank you so much for the inspiration. oh my goodness these are all so wonderful! Love the new images! Delightful tags! I'd love to make some of these for my baked goodies I like to share at the holidays! I adore both of your tags, Tracey! Thanks for letting us be a part of your event!! Wonderful tags! Great ideas and inspiration! What a bunch of awesome and adorable tags. The naughty nice check box tags are so cute! I have never heard of Sugar pea! Cute tags! Love the one with the partridge & the jingle bells! 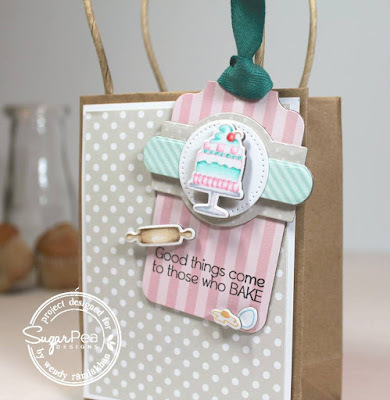 Fun tags from Sugar Pea! Oh my goodness Tracey, these tags are SO SWEET! So decorative and creative. Who wouldn't want any of these under their tree? BOTH your tags are CUTE, I prefer the Kraft one ... I'm still deciding on whether to use lots of Kraft for our tags & cards this year, LOVE it with red-white-black!!! These are all so adorable! 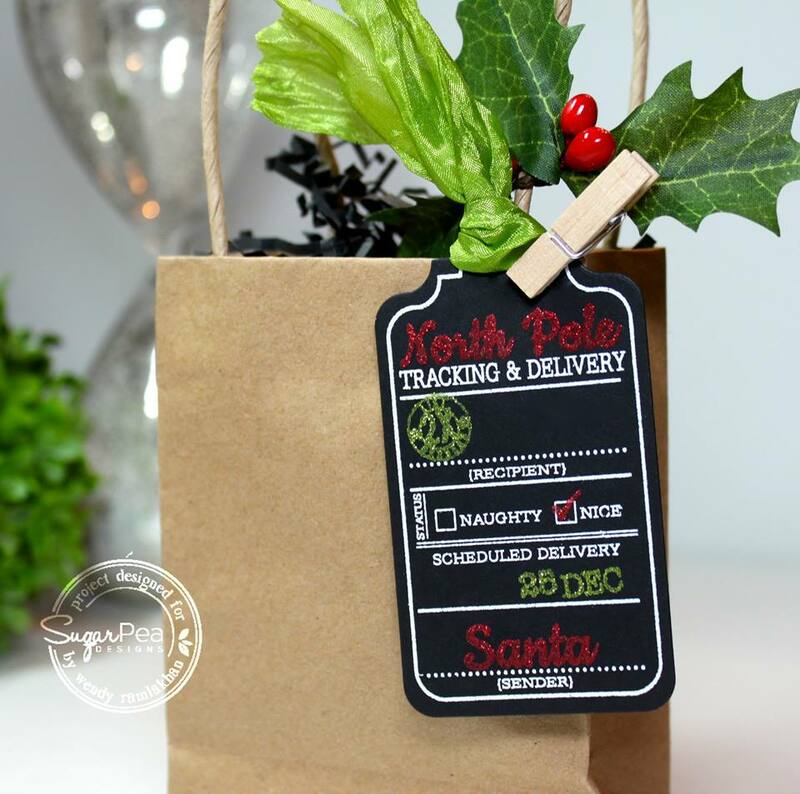 I love the North Pole tickets from Sugarpea Designs!! Adorable tags! I especially love the shaker, would never have thought to do that on a tag. Thanks for the inspiration! Such a lot of cute tags. I love the Santa's Gift Tag stamps and die. I was not familiar with SweetPea Design's, but they are on my radar now. I just have to wait for some stuff to get back in stock. Lots of really good items. They are adorable and pretty! Full of inspirations today. Thank You! Lovely! 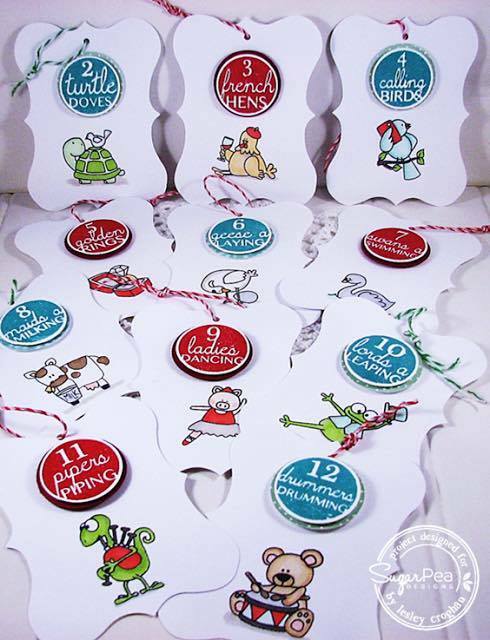 Really like the 12 Days of Christmas! What a fun collection of tags today!! Oh my!!! I love these products from Sugar Pea!!! And all of these tags are just awesome!!! Thanks for the inspiration! These tags are absolutely adorable! Chalkboard, baker, love them all! Wow! A whole "gaggle" of beautiful tags! Oh my goodness so much sweetness form the SP team!! I love both of your tags Tracey and am glad you shared them both!! Super cute!! 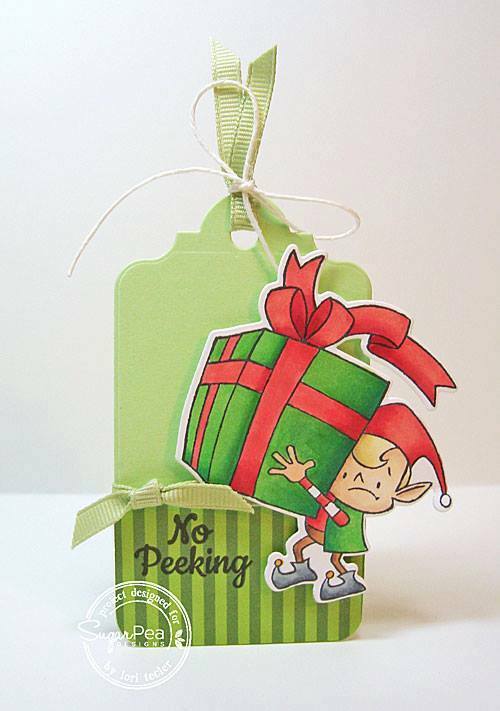 Love the No Peeking Elf!! I am in love with all th adorable Elf stamps this year, and especially loved Chaitali's tag, although they are all awesome. Thanks for the chance to win. Love Sugarpea! Such fun varieties of tags! Each and every creation is so inspiring with loads of ideas! Super creative! I love the little elves...adorable!!! The designs are endless ... love them all. I've never heard of Sugarpeas! 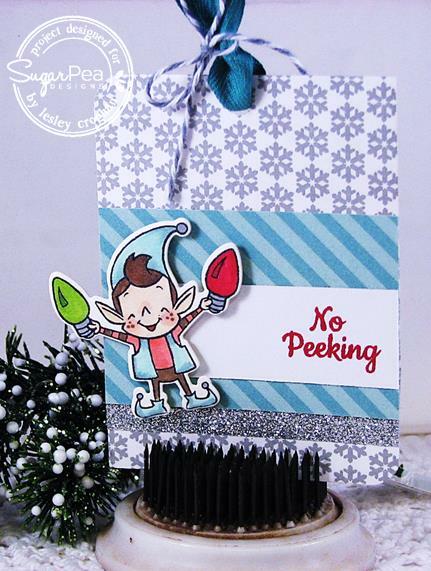 Such adorable designs, and great cards!I especially love the little elves. That elf image is adorable. Oh, my gracious! These couldn't possibly get any cuter, and I'm totally loving that tracking and delivery image! FUN! I can't keep up with all the cuteness...good thing I can follow on Pinterest. : ) You've really outdone yourself this year, Tracey! Oh my....so many wonderful tags, they inspired me so much I had to order these new stamps! Darling images from SugarPea and wonderful tags using them. These ladies have some serious coloring chops! Wonderful tags! Love that tracking and delivery stamp! 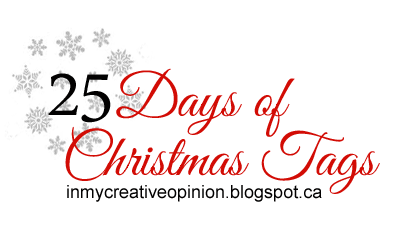 So much inspiration from all the tags of the 25 Days of Christmas Tags! They are all so cute. The North Pole Tracking for is a fun design. Those Sugar Pea designs are awesome! Sugar Pea Designs are some of my most favorite stamps and I LOVE Lesley's 12 tags of Christmas. 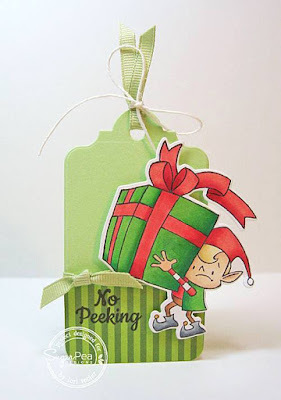 LOVE these super cute tags, those elves are adorable! 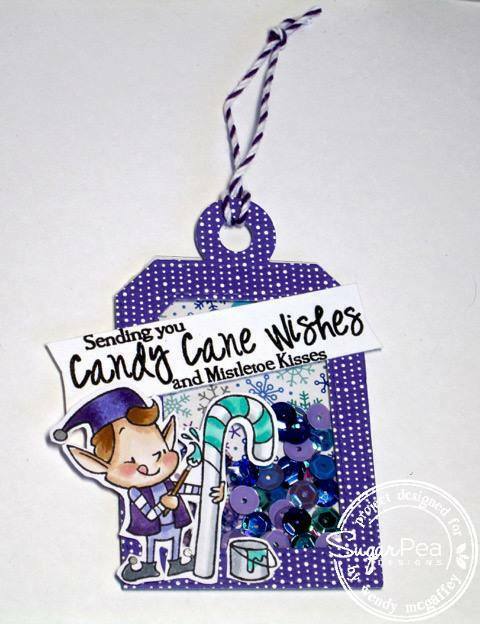 Thanks for introducing me to another great stamp company today, Sugar Pea designs! Such lovely creations! 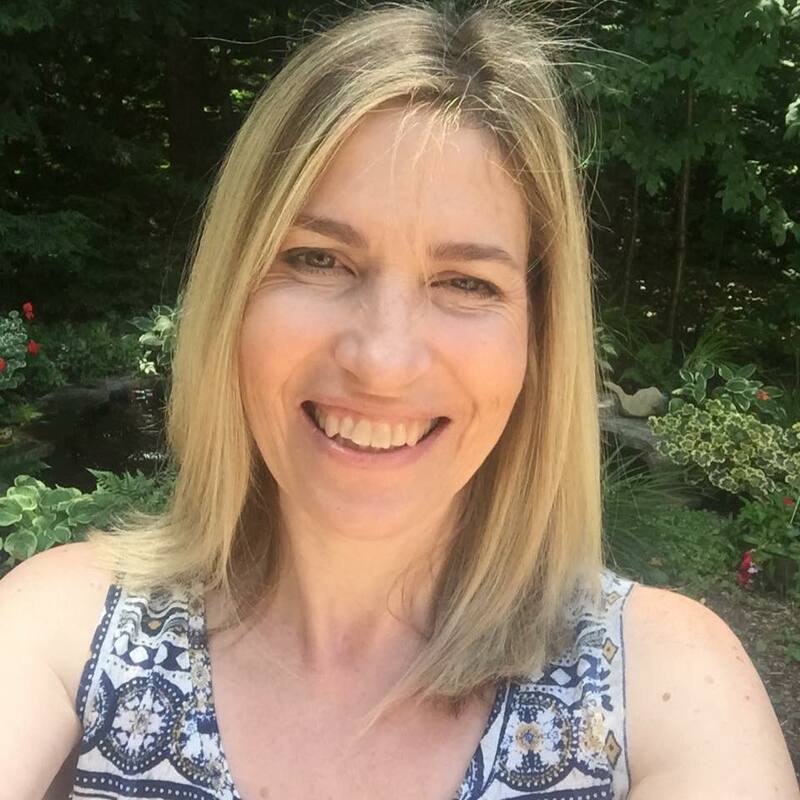 I love SugarPea Designs! Normally I would not think of black as a festive color but I LOVE how the team used it as a background for red & green sparkly sentiments - so pretty!! Lovely tags again today! Love all these ideas! Such cute and festive tags! These are the most adorable tags!!! Thanks for inspiring to break out my postmarks set.